(CNN) – Even the smallest among us can be big heroes. Take the lowly wax worm, for instance. The larva of the greater wax moth is considered a huge pest in Europe, because it acts as a parasite in bee colonies. However, its bizarre eating habits may help solve a huge environmental problem. See, the wax worm is apparently not averse to eating plastic. An amateur beekeeper in Spain discovered this when she plucked some of the pests from her beehives and put them in a plastic bag. The worms eventually ate little holes in the bag, chewing through the plastic at an alarming rate. This led to a wonderful idea: What if these so-called pests could actually help break down polyethylene, a common and non-biodegradable plastic currently clogging up landfills around the world? How good are these little grubs? The beekeeper is actually Federica Bertocchini, a scientist at the Institute of Biomedicine and Biotechnology of Cantabria. She and two researchers from the University of Cambridge’s Department of Biochemistry put together a study to see just how good these little grubs were at passing the plastic, so to speak. The answer? Very. 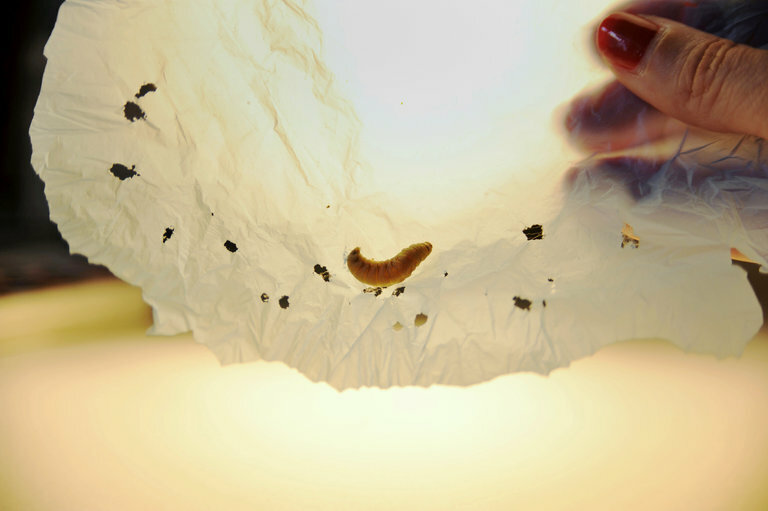 The team found the wax worms broke down polyethylene plastic bags faster than other recently-tested methods. There are still more tests that need to be done, but if scientists can replicate whatever causes the breakdown, if could be used to alleviate the burden of non-biodegradable waste. “If a single enzyme is responsible for this chemical process, its reproduction on a large scale using biotechnological methods should be achievable,” said Cambridge’s Paolo Bombelli, first author of the study. “To confirm it wasn’t just the chewing mechanism of the caterpillars degrading the plastic, the team mashed up some of the worms and smeared them on polyethylene bags, with similar results,” a summary of the study reads.